Learn the many ways you can earn FREE Tattoos from Tattoo City. At Tattoo City we value our clients and aim to give them the best quality tattoo experience possible. We realize that our business can only succeed if the people we tattoo are more than happy with their body art and tell friends and family about us. Word of mouth referrals are what has kept us tattooing Chicagoland since 1994 and we want your referrals. The more new clients you send to us the more you can earn towards your own tattoo session, possibly even FREE Tattoos. Check out our NEW Referral Program. When you get tattooed, you'll get a few of these cards to hand out to your friends and family. 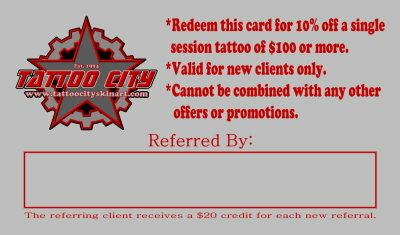 When new clients bring in the referral card, that client will receive 10% off a single session tattoo of $100 or more. Cannot be combined with any other offer or promotion. When a referral card is returned, the person that referred the new client will receive 1 reward point in their account. Each point is worth $20 credit on their account and can be used to apply to their next tattoo session of $100 or more. There is no limit to the amount you can earn, but we can only apply $100 worth of credits at a time. Get us new clients and we give you credit towards your next tattoo. Referral credits will automatically be removed after 1 year in the system. 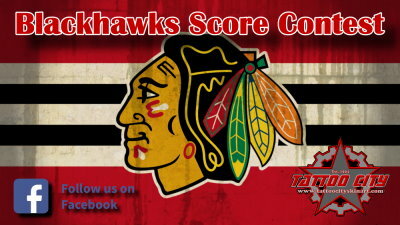 Chicago Blackhawks Score Contest only on Facebook. The folks at Tattoo City are huge fans of the Chicago Blackhawks and we know many of you are too. During the Hawk's regular season and playoffs, if they are that good, we run a Guess the Final Score contest on our Tattoo City Facebook page for each game. We post the contest announcement, one hour before the game, on Facebook and you simply comment with your prediction for the final score and winner of each Blackhawks game. The first person who commented with the correct score WINS a $50.00 Tattoo City Promotional Certificate toward a $100 tattoo. Please DO NOT duplicate answers. Only one guess per person so check what other people guessed before you post your guess. If you have multiple guesses listed, you will not be qualified so please delete any extra comments you may have. NO guesses will be accepted after the game begins. (This is the FINAL score, regardless of the period/OT) Winner will have one week from the night of the game to stop by the shop and pick up their promotional certificate. Promotional certificates cannot be combined with any other promo or used as retainers. Tattoo City wants to help you celebrate your birthday, and we do so by emailing our clients, and people who sign up for our mailing list, a Promotional Certificate for $50 off a tattoo of $100 or more that is good for six months from the date it was sent. All you need to do is print out your certificate and bring it with you for your appointment. 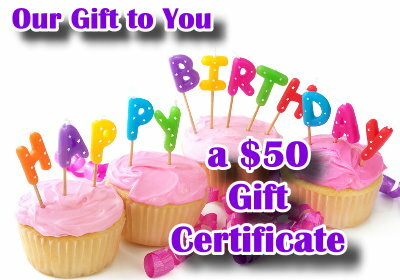 Check your email on your birthday for our $50 gift to you and have a Happy Tattoo Birthday! Promotional certificates cannot be combined with any other promo or used as retainers. If you will be using a Birthday Certificate at your final appointment, please let us know when booking. If you unsubscribe from our mailing list you will no longer receive the birthday gift certificates. We rely on positive 5 Star Reviews in our social media and search engine platforms across the internet and we do our best to give you 5 Star tattoos and service. If for any reason you did not receive that kind of quality service please contact us right away at tattoocity@aol.com before leaving a less than 5 Star review and our owner, Larry Brogan, will contact you to see what we can do to make you happy and help us remedy any issues or complaints. 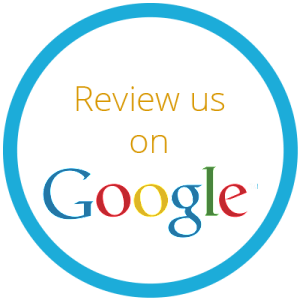 If you received a great tattoo and liked your overall experience please take a moment to let others know by giving us a positive review on the internet. 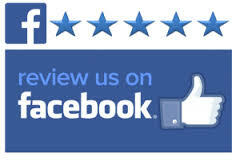 Click the icons below to be taken to some of our reviews.